Date & Time Details: All current online registrations are for day passes only. Throughout the ages, practitioners have explored the elasticity of language to express understanding of dharma, proximity to the present, realization of impermanence, and encounters with the mind, just to name a few. 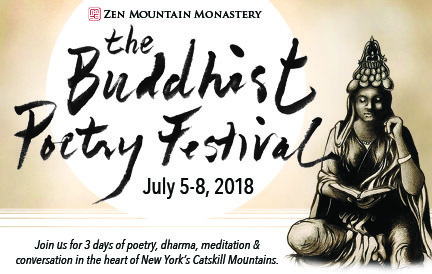 The Buddhist Poetry Festival was created in celebration of this impulse to creatively share those personal experiences that seem to touch upon the universal. The Buddhist Poetry Festival is designed for anyone who resonates with Buddhist teachings, regardless of their own level of engagement with any particular tradition. In addition to a full schedule of activities, there will also be unstructured points in the weekend, providing more time to reflect on the work we’re encountering, our own writings, or to engage more with our fellow writers and lovers of poetry. We are honored to feature some of our time’s most celebrated voices in the conversation between Buddhist practice and creative writing. Over the course of the weekend, we’ll hear them read their own work; share their thoughts on writing as a spiritual practice and form of engagement; and work on our writing with their direction and guidance in several illuminating workshops. Additionally, we’ll consider the vast cultural wealth that Buddhist poets inherit today by considering the legacy of ancient hermit-practitioners who often worked in obscurity, not knowing that their musings would be savored all these centuries later. NOTE: Day passes include lunch and dinner. Overnight registration includes on-site accommodations. 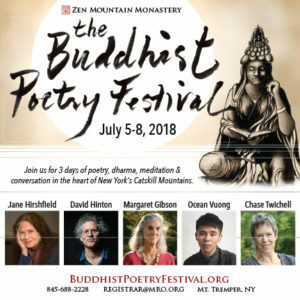 To find out more about the Buddhist Poetry Festival’s featured presenters, please visit us at buddhistpoetryfestival.org.